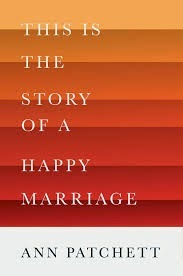 a book chick: "This is the Story of a Happy Marriage"
"This is the Story of a Happy Marriage"
my take: This is a compilation of Ann Patchett's various magazine articles and a few new essays ~ the book takes the title from one of the new pieces. What I love about this collection is the variety of topics and how I was able to piece together her life story through various perspectives the articles exposed - about her marriages, dogs, travels, writing and bookstores. "I think that what influences us in literature comes less from what we love and more from what we happen to pick up in moments when we are especially open." "There are two kinds of educational experience you can have in college. One is passive and one is active. In the first, you are a little bird in the nest with your beak stretched open wide, and the professor gathers up all the information you need and drops it down you gullet....In the second kind, you are taught to find the information, and how to think about it, for yourself. You learn how to question and engage." Hubby read this right after me and we chatted about it for days; at first I thought this would be a tough discussion book (because it's almost like short stories) but after so much thinking and talking about it, I've changed my mind and think this is ripe for discussion.